The journey of the English language is a long and winding road that stretches back over the centuries. English arrives with us today as a result of invasions and influences that span the globe. Who could have imagined that the Old English language brought to England by the invading Germanic tribes, the Angles, Jutes and Saxons, in the 5th century BC would evolve into the modern international language it is now. Somewhere in the middle of that journey we can zoom in on a period commonly known as Early Modern English (1500-1800) where the English produced starts to look like the English we recognise today. This is the period that produced the famous William Shakespeare, the English poet and playwright, widely considered the greatest writer in the English language with his plays and poems still hugely popular nearly 500 years after his death. 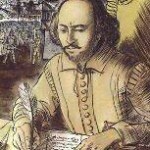 Many people, particularly schoolkids!, will say that Shakespeare is difficult to understand, but a fascinating fact about Shakespeare, is that a huge number of expressions we use in everyday life originate from this prolific English writer. Here are just a few, set into sentences, that were either popularised by or originate with William Shakespeare. All are regularly used by native speakers today, even if they don’t realise it!. He’s such a funny guy, he had me in stitches! I know it may seem like a crazy idea but there’s method in my madness. It’s really strange, it is as though he just vanished into thin air! Well you know what they say, you can have too much of a good thing! It’s very sad, he’s become a laughing stock in the village with his behaviour. He’s got an unbelievable appetite! He’s eaten us out of house and home. We checked his pulse, he was as dead as a doornail. It’s neither here nor there what he thinks about the situation. It was amazing! In the twinkling of an eye she was gone. Why not visit Shakespeare’s Globe Theatre on the Southbank (opposite side of the River Thames to St Paul’s Cathederal); see a show, visit the exhibition.